Tullow Community School was established in 1978 from the amalgamation of the Brigidine Convent Secondary School, the Patrician Brothers’ Secondary School and Tullow Vocational School. It aims to provide a comprehensive system of post-primary education, open to all the children of the community. The school is co-educational and multi-denominational. Tullow and its surrounding area have a unique tradition of schools. This tradition stretches from the time of St. Patrick to the present day. It has benefited generations of local people and students from outside the locality. The educational seeds sown in Tullow have spread to many parts of the world. The story of our local schools is one of pride, service and interdependence. James Keeffe, Bishop of Kildare and Leighlin, came to live in the Aghade area, outside Tullow in the mid 1700s. Already an old man, he embarked upon the building of Carlow College. In the emerging, more pleasant political climate this college was founded to provide for education of clergy and laymen. In the meantime a young curate, Daniel Delany, joined him in Tullow. Born in Mountrath, Delany was French educated. He taught in the Irish college in St. Omer and succeeded Dr. Keeffe as bishop at the age of thirty five. Strenuous efforts were made by Bishop Delaney to attract continental religious orders to Tullow to service the growing educational demand. These efforts were unsuccessful. At his invitation, some members of his Sunday school teaching staff agreed to form themselves into two religious orders. On February 1, 1807 he re-founded the Brigidine Sisters. To emphasise the link with earlier times, he planted an oak sapling from Kildare at the site of Tullow’s new convent. The tree stands tall and strong to this day and birds continue to make their nests in it. The following year, 1808, saw him found the Patrician Brothers on February 2. Thus Tullow is unique in Ireland for giving birth to two religious orders in a small rural town. As the years went by, the custom grew whereby girls from neighbouring areas lodged in the town and attended the convent school for classes. In time, accommodation was provided in the convent complex for the students. Thus the famous Brigidine boarding school evolved. Girls attended from all over Ireland, particularly from Wexford and Dublin. Day pupils were also catered for. Music and musical productions were a noted feature of the school. In the years leading up to formation of Tullow Community School, senior classes in the Brigidine and Patrician secondary schools were amalgamated. There was also some co-operation with the Vocational School. The last principal of the Brigidine secondary school was Sr. Ambrose Doran with Ms. Peggy Wybrant as Vice-Principal. 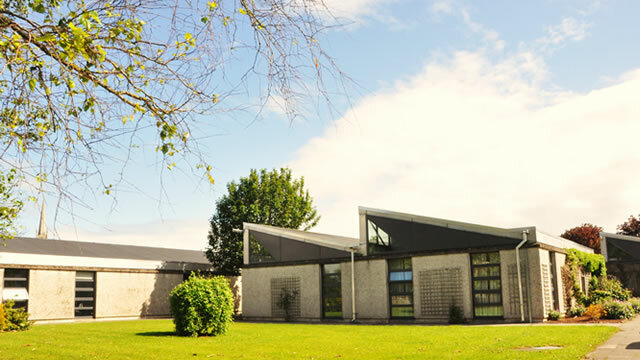 As well as serving the local Tullow community, Brigidine education spread to such places as Mountrath, Abbeyleix ,Goresbridge, Paulstown and Dublin. Foundations abroad included England, Wales, Australia, New Zealand, the United States and Mexico. The Brigidine novices underwent spiritual formation in what is now called Teach Bride. Bishop Delany decided to replace the decrepit penal chapel. The ruins of this chapel are in the council yard in Old Chapel Lane. The new Tullow parish church opened in 1805. In 1852, the Patricians acquired the site for their monastery and, as a condition of sale, were required to construct what is now known as New Chapel Lane. This monastery became a boarding school and training centre for the order. Across the road stood the thatched primary school which also catered for the secondary boarding pupils who originally had boarded in Mill Street. This building continued as the secondary day school, following the transfer of the primary school to its present site on the Course in 1910. In 1952 the brothers purchased Mount Wolseley, renaming it Mount St. Joseph. Brothers Justinian, Otteran and Daniel gave distinguished service as principal in the final years of this school. The last Vice-Principal of the Patrician Secondary School was Mr. Ger Cummins. The school amalgamated with the Brigidine and Vocational schools to form the Community School in 1978. The secondary building was subsequently demolished. The national expansion of second level pupil numbers in the 1970s put pressure on the available resources of school accommodation and teaching power. Department of Education officials, notably Sean O’Connor, espoused the idea of a community school as a response to this challenge. The provision of these schools was envisaged to provide both academic and practical instruction to all young people of the area. The schools would also be committed to adult and community education, as well as making their facilities available to the local community for sporting and cultural activities. Tullow Community School opened in 1978. The first principal was the late Mr. C. H.Finlayson, formerly head master of Tullow Vocational School and the first Vice-Principal was Sr. Margaret Creagh who had previously served as Deputy Head of a large Liverpool comprehensive school. Sr. Margaret was succeeded in 1988 by Ms. Anne Keating. She in turn was succeeded by Mr. Timothy Moriarty in 1995, who was then succeeded by Ms Alice Ashe in 2011. Later Mr.Christopher McQuinn became Principal in 1988-2005, followed by Mr. Patrick Flynn 2005-2011. The current Principal is Mr. Paul Thornton 2011-present.